Spring is just around the corner for us. The sun, the tree buds and the warm air are in our reach! Call me at 989-7644 or email judyalbright@snet.net to reserve a space. April showers make the sky so gray. We need a little color in our lives. I have more to do! But I made a lot of progress today. This painting is not done, but I wanted you to see what happened after the under painting. What you see above is a detail of the painting so far. I really like this surface and things are going pretty well so far. Wish me luck. Today I painted because I had scheduled the time to do it. Painting a painting requires more than skill. Regular art making routines are a must. I am beginning a new painting on a beloved surface! Brand new, never before painted on Ampersand Pastel Board. This piece is 18x24" and it is my favorite! Last week I tried a home made surface that I had never used before. I used a foam roller to cover a piece of gator board with clear gesso mixed with a little pumice. Many pastel artists like it, but I had two disasters in a row. But then I realized something. My now beloved surfaces had more than two disasters on them before I got familiar with how to create successes on them. Sometimes you have to really give something quite a few tries before writing it off. Anyway, tonight I return to my comfort zone. Let's hope it goes well! Tomorrow I will play with my pastels! Can you guess what color this tulip might become? Right now it could be almost any color you can think of... pink, red, peach, yellow. When I lay in my values correctly it really opens up the possibilities of how you choose your colors as you paint. Here is the still life set up I have for us in the studio. I have chosen to paint just a small area of the scene. I am excited to see how the values will lead me in color directions. 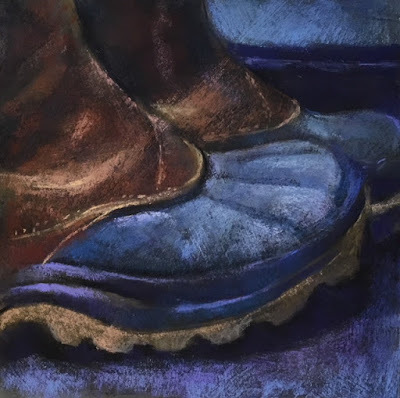 Stay tuned, as I continue to play with my pastels! Winter days can be so gray. We need a little color in our lives. 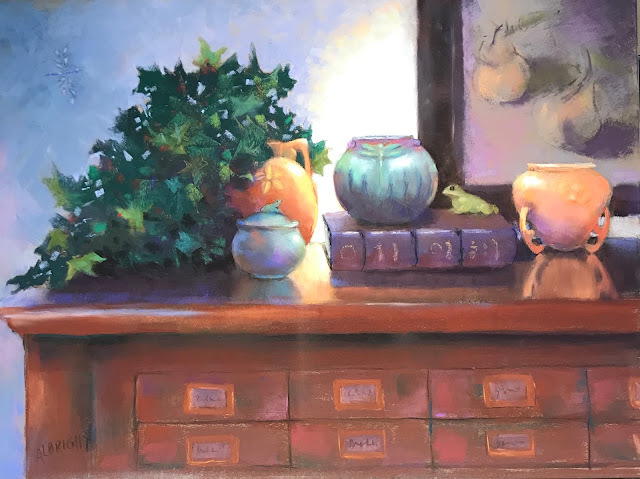 Join me in exploring the beautiful, rich colors you will find when you paint with pastels. A new series of classes begin next week. 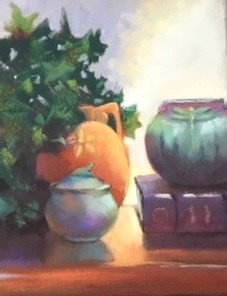 If you are not familiar with my work, visit my website www.judyalbrightart.comCall 989-7644 or email me at judyalbright@snet.net to register. 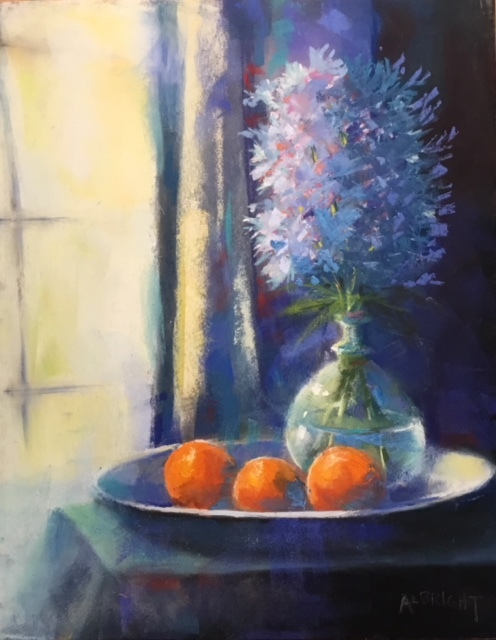 Join this class and experience a nurturing community atmosphere that will ignite artistic and personal growth whether you are a first time explorer or have had some experience. 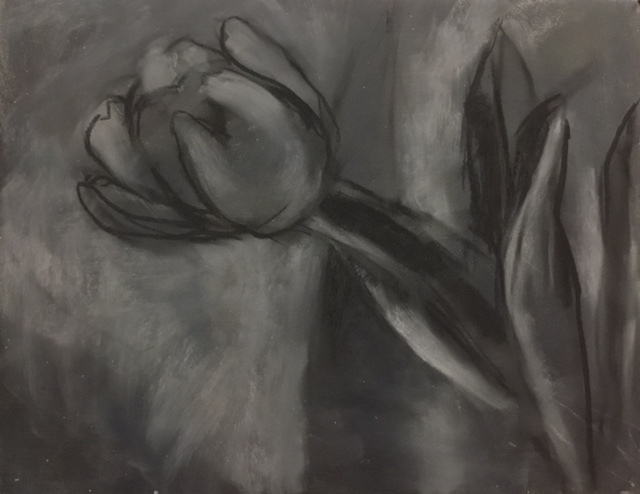 Students in this class will develop basic pastel painting techniques as we seek to discover our own style. 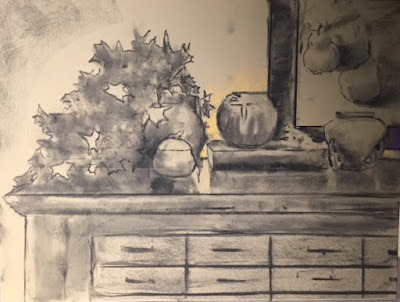 We will explore color and composition, and refine our drawing skills. All classes are held in my Middlebury studio.